‘Hitchhiker’ is proudly painted in large, art-deco lettering across the windows of this bijoux but jolly eatery owned by chef Morten Sjøvik. Nestled in Mathallen, the culinary hall of Oslo, the bright pops of colour and string flags make a happy contrast with the minimal, Nordic-style furniture and chilly temperature outdoors. We joined Morten at Hitchhiker to cook some fusion-inspired Snøfrisk® dishes and discover more about his playful style of cooking. Tell us more about you and the concept of Hitchhiker. My name is Morten Sjøvik and I work as the head chef of Hitchhiker. I’m 34, but I’ve been working in the industry for 16 years - practically half of my life. I trained with the Norwegian culinary team for 3 years and then a variety of restaurants before joining Hitchhiker. At Hitchhiker, we make street food from all over the world. We want to make eating out easy - all our dishes are designed for sharing and relaxed dining. You won’t find your traditional three course meal here. As for the dishes, everything is up for grabs: every ingredient and all types of cooking. I believe in a global cuisine with a focus on simplicity, taste and balance - of flavours and textures. Every dish on our menu has a little Hitchhiker twist to make it special. 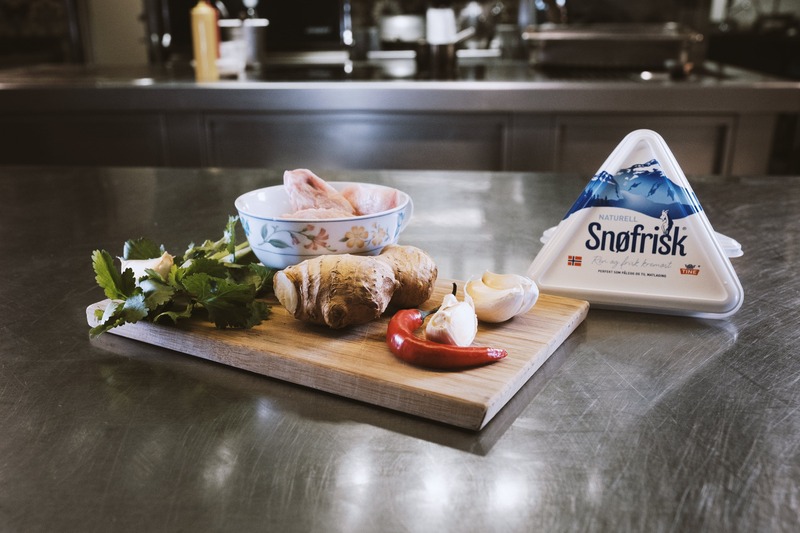 We loved the Snøfrisk® fusion recipes you cooked with us today. Thanks! Snøfrisk® has such a distinct flavor profile, so it is great to use in fusion food. It’s pronounced taste doesn’t disappear despite the heavy flavouring of the different ingredients we used. It carries well with a lot of different cuisines and adds that Nordic twist to all different types of food. What are your greatest cooking inspirations? My family. My grandmother and mother first and foremost. I dreamt of being one of the cool chefs I saw on TV. When I got started in the business, I was around 15 years old and just so happy to be scrubbing dishes - the real dirty work! But it felt one step closer to achieving my goals. At Hitchiker, I feel inspired by thinking about what I would most like to eat today - what I want to experiment with that day. Or I spot a dish that I’ve never seen before when I am travelling. Kimchi, for example, was my first taste of the Korean kitchen and is one of my favorite side dishes. When I come home, I try to make it in classic, traditional ways - or distill the main idea of the dish and blend it with my own thinking. Let’s talk about fusion cooking. What excites you? How does it work? Fusion cooking is an exciting way to bring magic to the kitchen. You can take the best from every country in the world and blend it into something nobody has made before. As long as the flavours balance well, anything goes. Fusion cooking doesn’t need to be complicated - just as you balance flavours in classic recipes, ingredients from different lands must bring out the best in each other. Sour, salt, sweet, umami, fat and bitter tastes all work together to balance each other out - for example, when you salt a dish, you’re balancing anything that may be too bitter, which is a quality most palates rarely tolerate. Any advice for people wanting to try their own fusion dishes at home? First and foremost, always pick the very best quality ingredients. Choosing them does depend on the item, but if it is fresh, it should always smell pleasing, be crisp and look natural. It does take some time to know the difference between certain items and if they’re good enough - especially with manufactured foods like cheeses. Don’t be afraid to ask a chef! We love to talk about our produce. If you’re looking to try your own recipes, start by preparing classic food from any region with the real ingredients and as faithful as possible to the original methods. When you get the hang of that, you can start replacing ingredients with similar items from across the world. Eventually, you’ll know what matches with what and you can really start mixing things together. Thanks for meeting with us Morten! You can visit Hitchhiker in Mathallen, Oslo - or cook his five Snøfrisk® Fusion recipes here.